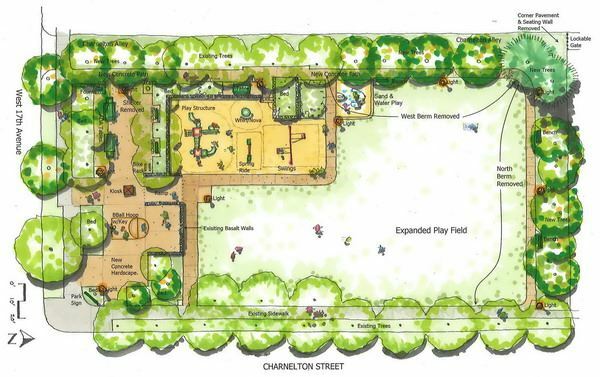 Join the Friends of Charnel Mulligan Park! The City of Eugene, Eugene Police, and JWN leadership agree that the future success of this park depends upon a committed partnership with neighbors. Please join us! 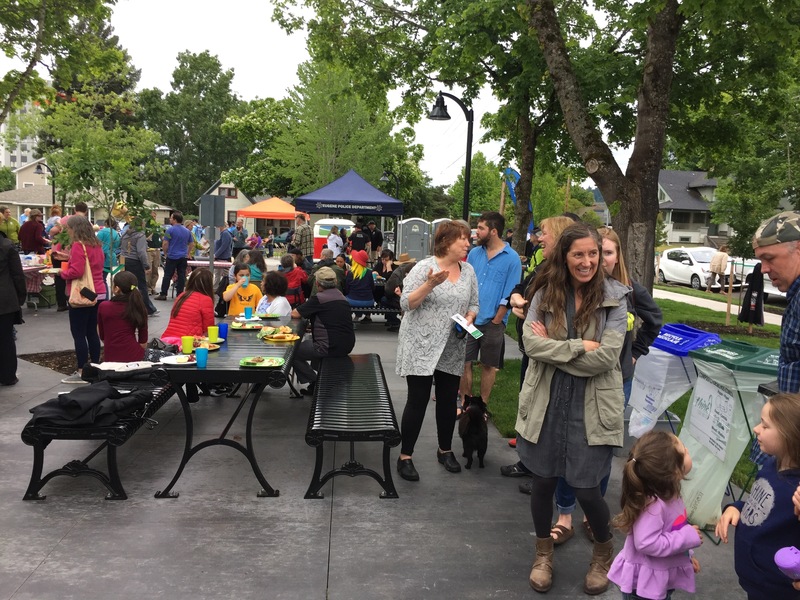 To partner with the City of Eugene, the Eugene Police Dept., and other relevant entities to promote safe and welcoming activities and events in Charnel Mulligan Park; to organize periodic work parties; and to encourage and support Park Watch and other park monitoring and policing activities. Charnel Mulligan Park is open! Jefferson Westside Neighbors Summer Picnic Potluck and Charnel Mulligan Park Grand Opening Celebration a EUG Success! 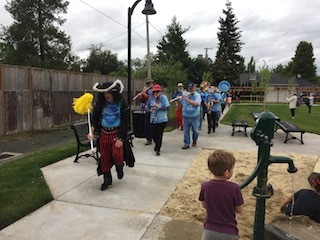 Charnel Mulligan Park enjoyed its grand opening and the JWN Neighbors celebrated its annual picnic with more than 400 cheering neighbors under cloudy, yet dry, skies on Thursday, June 15. The event began at 5pm with a parade, led by the One More Time Marching Band, from Wayside Park at 15th and Charnelton to the newly-renovated Charnel Mulligan Park. City of Eugene landscape architect and planning project manager Philip Richardson welcomed the crowd and explained the history of the park’s renovation, noting the involvement of JWN Neighbors, New Hope Church, the Eugene Police Department, Park Watch, Cornucopia, the National Association of Realtors, Capstone Settlement Fund, Eugene Parks Foundation, and SEHS Integrated Outdoor Program. 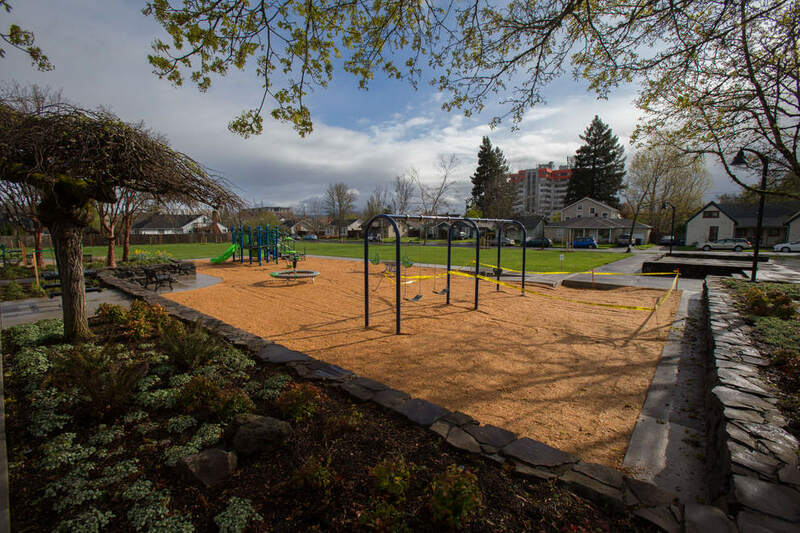 As he said, the park represents the best work of a community, “inviting everyone to participate, being transparent, digging into the issues, finding a workable balance.” Eugene Mayor Lucy Vinis then cut the ribbon officially opening Charnel Mulligan Park. The One More Time Marching Band provided lively music. Friends of Trees offered tree tours of the Park and the surrounding neighborhood. New Hope Church and Cornucopia served up burgers and cake. With support from the Eugene Neighborhood Matching Grants Program, Eugene Sunday Streets gave out free bike and skateboard helmets to kids and adults. Greater Eugene Area Riders (GEARS) promoted safe cycling and the organization’s weekly rides. The Eugene Police Department offered tips on neighborhood and park safety. Attendees played Frisbee, twirled hula hoops, and hopped across the fresh grass in a gunny sack race.